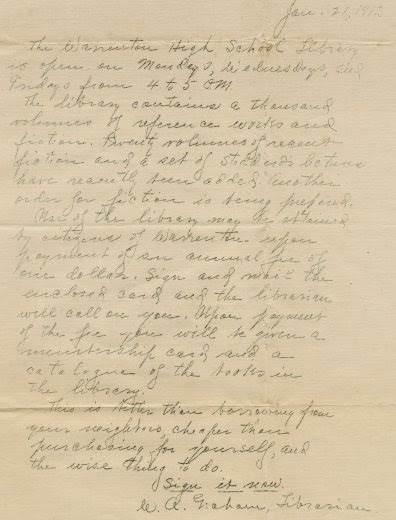 Postal librariana related to school libraries is difficult to find so I was delighted when I found a 1912 hand written flyer (see above) mailed by the Warrenton (NC) High School Librarian to members of the Warrenton community. The Librarian W. A. Naham extols the resources of the high school library and then offers to make the library available to non-students for an annual fee of $1. A sign up card was enclosed. He/she ends with: "This is better than borrowing from your neighbors, cheaper than purchasing for yourself, and the wise thing to do. Sign it now." Today Warren County Schools has two high schools in Warrenton. No information on their website about their libraries. We’ve all done it… You want to garner a quick overview of a topic, so without thinking you drop the terms in a Google search, click on the hit to Wikipedia, and engage in information gathering. Of course most of us have at least considered the credibility (or lack thereof) of the information, although we still go to Wikipedia as if by default. Here in the library, we like to use errors/hoaxes on Wikipedia and the prejudiced editing of Wikipedia articles as learning points, with a plug to our subscribed online encyclopedias. But we know students will use Wikipedia just as we all do. It all still begs the question: How credible is Wikipedia? The exercise revealed numerous errors in both encyclopaedias, but among 42 entries tested, the difference in accuracy was not particularly great: the average science entry in Wikipedia contained around four inaccuracies; Britannica, about three. Nonetheless, many took Nature’s proclamation to mean we could, more or less, rely on the information gleaned from Wikipedia. Personally, I took this to confirm that there is no one “truth” and that the credibility of “facts” will always be debated based on someone’s viewpoint. Most Wikipedia articles representing the 10 most costly medical conditions in the United States contain many errors when checked against standard peer-reviewed sources. Caution should be used when using Wikipedia to answer questions regarding patient care. And thus, the pendulum swings the other way. As the Daily Mail says, “Do NOT try to diagnose yourself on Wikipedia!” and with that, the (lack of) credibility of Wikipedia is again introduced into our collective consciousness. I find that Wikipedia is great for stuff that will never make it into the Encyclopædia Britannica, for example the Berghain in Berlin (“the best club in the world”), and that it’s helpful for doing pre-research: getting my acronyms straight, deconstructing my search topic into related terms, confirming what year something took place. I then use this information to go elsewhere, to my trusted sources that I consider credible. What do you think? When do you go to Wikipedia and when do you go elsewhere? What are your alternatives to Wikipedia? Leave your thoughts in the comments. Furriends for Finals is back! It’s that time again!!! Monday and Tuesday from 12p-2p come join us at Gleeson Library and meet some very friendly dogs! Our friends from SPCA are here to help you take some stress off from this crazy finals week. So come on by Gleeson Lobby to de-stress with some furry friends.